Thirteen-year-old Logan is not thrilled with moving - especially when he sees how run-down the new house is. His mother maintains that once they fix it up, it will be "adorable," but Logan is skeptical. When Arthur, the weird kid next door, informs him that the old woman who owned the house before them was murdered in it, Logan isn't terribly surprised. It looks exactly like the sort of place someone would be murdered in, after all. At first his parents refuse to believe it, but after a trip to the library with Arthur, Logan comes home with photocopies of newspaper stories that tell all about it. Apparently some money had been embezzled years earlier from a local amusement park - quite a lot of money, at least a million dollars - and the cash just disappeared. The old woman had worked at the park, and Arthur thinks the murderer was looking for the money. Logan is torn during much of the book. He kind of likes Arthur, a precocious, occasionally obnoxious eleven-year-old, but he knows from experience at his old school that being friends with someone like Arthur will be the kiss of death for any social aspirations he might have. He was hoping to make a fresh start, have the right clothes, play on the right teams, but he finds himself being drawn into the mystery of the missing money, and when he meets some of the popular kids, he has to admit he has very little in common with them. Arthur is smart and adventurous, and when he takes Logan to the ruins of the amusement park, all covered in kudzu vines, in search of clues about the missing money, Logan finds himself committed to solving the mystery. Their search will lead them down some dark and winding paths, and they will come up against some of the more dangerous inhabitants of Logan's new town - a sleepy little town where, he thought, nothing very interesting could possibly ever happen. Arthur is not the only annoying character. Logan's mother is superficial and self-involved, and would like to hobnob with the snooty social scene of the new town. She drags Logan and his father to a party so they can meet the "right people," and at that party Logan is told by several adults that athletics are more important than reading, that he shouldn't have his nose "stuck in a book," and is lectured about the importance of "fitting in." That didn't sound terribly realistic to me, but maybe that's just because no one in my circle of friends would ever dream of saying such a thing! Logan's father is much more down to earth, thank goodness (although I couldn't help but wonder what the heck he saw in his wife!). I found it refreshing to see such flawed people depicted in a children's book without having their flaws be the whole point of the story. Often parents are just vague background figures for the main action of the book. 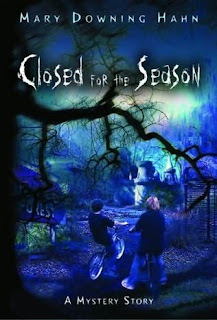 This was an enjoyable mystery novel that is perfect for summer reading, with the boys on vacation, exploring the abandoned amusement park and hightailing it away from the bad guys on their bikes. I enjoyed the two main characters the most - they were not stock mystery-solving boys, particularly Arthur, who managed to get on my nerves without ever quite losing my sympathy. I loved the fact that Arthur could always go faster and farther on his beat-up old girls' bike than Logan could on his snazzy new bike with tons of gears. And I loved the moldering, mysterious ruin that is the amusement park. The ending was a little over the top for me, with guns and helicopters and kids getting into fairly dangerous situations where they really should have at least left a warning note about their suspicions, but that's probably just the worrywart mom in me reading the book. (And I'm not entirely convinced that two million dollars would fit inside a small briefcase that a young teen would be able to pick up and carry easily.) The mystery wasn't a tricky one, at least for this adult reader, but I'm betting that most young readers will be happy to go along for the ride. I found All the Lovely Bad Ones to be more complex and intriguing - not to mention creepy - but this still a fun mystery, and I'm sure I'll be recommending it a lot at my library in the coming months. Jen Robinson's Book Page: "This combination of realistic interpersonal dynamics with atmospheric, suspenseful mystery is sure to please kids. Especially those kids who aren't athletes, and have been known to spend an afternoon or two in the local library." Kiss the Book: " I think Hahn just gets better as she keeps writing." Readingjunky's Reading Roost: "The murder, the possibility of the killer's involvement in embezzlement, and the bulldozing of a local, historic amusement park all combine for some great adventure." Sounds really great if not a little creepy for a kids book! I completely agree about "I found it refreshing to see such flawed people depicted in a children's book without having their flaws be the whole point of the story". I didn't like Arthur, exactly, but I liked the existence of Arthur as a character, if that makes sense. And the setting was fabulous. I think that your assessment is dead on. Margo - I guess you'll have to read it to find out, mwahahaha! Jen - I know exactly what you mean. It was surprising to find that kind of character, but it made the story feel a bit more real, somehow. Sounds like a good holiday read. Like you though the ending sounds a little over the top though. Rhinoa - it was a bit over the top for me, but most kids will probably not be complaining!